In a letter to Jerusalem’s exiled leaders, the prophet Jeremiah called on them to work for the welfare of Babylon, the city to which they had been deported. “Seek the peace and prosperity of the city,” he wrote. “Pray to the Lord for it, because if it prospers, you too will prosper” (Jer. 29:7). From October 2-4, nearly 100 Anabaptist leaders gathered in Philadelphia to discuss what responding to Jeremiah’s charge looks like in the 21st century. 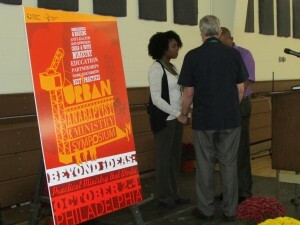 Participants came from cities including New York; Hampton, Virginia; Philadelphia; and Washington, D.C., to attend the Urban Anabaptist Ministry Symposium organized by Glen Alexander Guyton, chief operating officer for Mennonite Church USA, and Chantelle Todman Moore, Philadelphia program coordinator for Mennonite Central Committee (MCC) East Coast. The symposium invited urban leaders to discuss practical Anabaptist ministry in their cities. 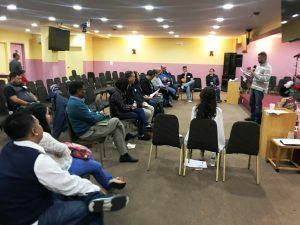 “Being a peace church isn’t just about not going to war – it’s about manifesting God’s kingdom in our own communities,” said speaker Addie Banks, executive director at The Groundswell Group in the Bronx, New York. During plenary sessions, Banks along with Al Taylor, pastor of Infinity Mennonite Church (Harlem, NY), and Ertell Whigham, associate pastor of Nueva Vida Norristown New Life (Norristown, Pa.) and executive minister of Franconia Mennonite Conference, shared “best practices” from their ministries. Workshop leaders drew from first-hand experience to facilitate sessions on youth and young adult ministry, education for urban leaders, immigration, developing community partnerships and dismantling oppression. Additional event sponsors included the African American Mennonite Association, Cookman at Emerging Ministries Corporation, Franconia Mennonite Conference, Goshen (Indiana) College, Kingdom Builders Anabaptist Network of Greater Philadelphia, Mennonite Mission Network and Philadelphia FIGHT. 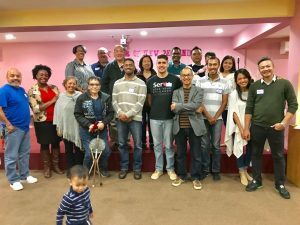 Ben Walter, one of the pastors at Ripple, in Allentown, Pennsylvania, said the conference was one of the best he’d ever attended. He appreciated that voices often on the margins were given ample space and emphasis, and found it “helpful and enlightening” to hear the diverse perspectives and experiences represented among attendees. Todman Moore hopes that urban Anabaptist leaders will convene in other cities in coming years. “We’d love to hear from Anabaptist leaders in other urban areas who are interested in discussing practical ministry in their contexts,” she said. She invites leaders to contact her (215-535-3624, ChantelleTodmanMoore@mcc.org) or Guyton (574-524-5282, GlenG@MennoniteUSA.org) to discuss planning similar initiatives in other cities. 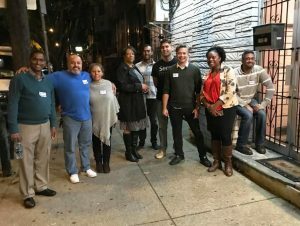 Philadelphia Anabaptist churches are planning the first ever Mennonite Central Committee (MCC) Benefit Festival in Philadelphia. This inaugural event is scheduled for Saturday, October 29, 2011, from 10 a.m. to 3 p.m. at West Philadelphia Mennonite Fellowship, 4740 Baltimore Avenue, Philadelphia, PA19143. In addition to supporting MCC’s programs around the world, half of proceeds of the sale will benefit MCC Philadelphia’s work with prison ministry, alternatives to youth violence, gun violence prevention and a low-income housing ministry. For more information about the festival or to coordinate donating an item for the auction, visit eastcoast.mcc.org/phillyfestival, e-mail PhillyBenefitFestival@gmail.com or call (215) 535-3624. One thing I’ve experienced this first week of living in Philadelphia is hospitality. I arrived last Monday at one in the morning and was picked up by my boss, Steve Kriss. Steve took me to his own house, because my more permanent housing arrangements hadn’t been settled yet. He welcomed me into his life and his work for three days, allowing me to live with him. He embraced my questions and my musings as he began to describe the city and the conference. He helped me start recognizing and thinking about the nuances and characteristics that I would run into in this new setting. I felt acknowledged and accepted into his work in the conference. Steve showed me only the beginning of the incredible hospitality that I have encountered in my first eleven days in Philly. 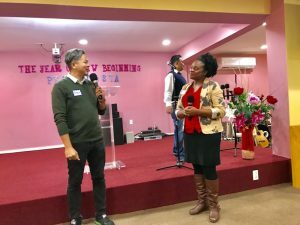 Last Wednesday I was welcomed into the home of Pastor Aldo, one of the pastors of Philadelphia Praise Center. Aldo lives in a home with five other Indonesian young men and an older woman we call “Ibu” or “mother”. I’ve come to dearly love staying in this house, even though I’ve barely been there a week. Everyone in the house is busy, but they’re all interested in each other’s lives. 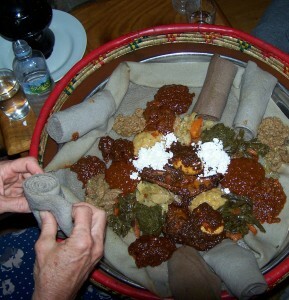 Food is a very important part of how we relate to each other. Almost every time I open the front door and come back to the house, the first question I’m asked is if I’ve eaten yet. Whoever is home at mealtime eats together. I fill my plate with rice and noodles and Ibu always tells me that I need more. She takes my plate from me and adds at least one more heaping spoonful. My roommates Yonathan and Ardi have embraced me as a friend and brother in Christ. They’ve taken me around the city and shown me the ropes. Yonathan showed off Chinatown and the Redding Market, while Ardi explained the train system to me and took me to the train station to buy my ticket to work. They’ve treated me to food, buying me McDonalds and Phileo Yogurt. We hang out together in the evenings, watching TV in the house and walking around the city. 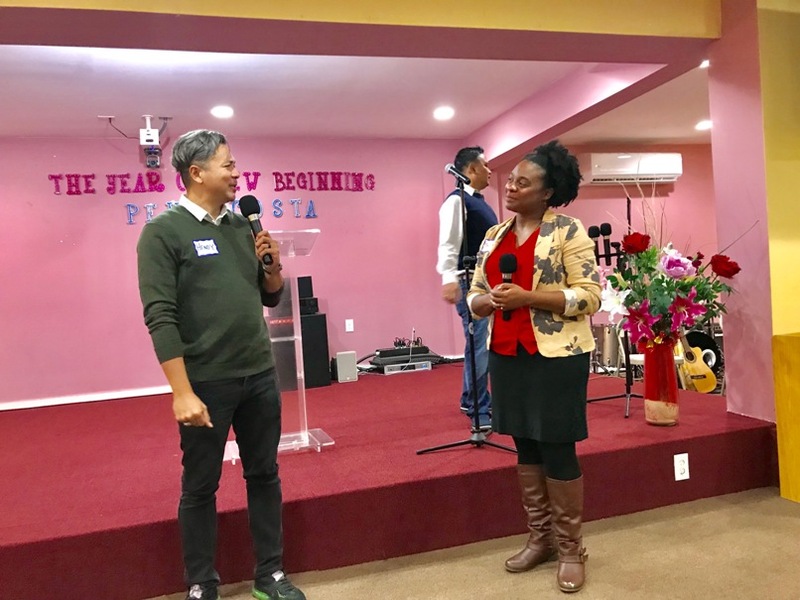 This past Sunday, I attended my first services at Philadelphia Praise Center, one in Indonesian and a second in Spanish. I was amazed at everyone’s willingness to include me. People welcomed me as I walked into the sanctuary, shaking my hand and saying “hello,” “hola,” or just giving me a big smile. Even though languages were different, communication was possible. In the Indonesian service, I listened to the message through a translator speaking into a head set. The songs weren’t translated, however, and many were sung in Indonesian. Most of the songs showed English translations alongside the Indonesian words on the screen in the front of the church, but I found myself drawn to singing the Indonesian. It was too hard to follow both the English translation and the Indonesian words sung by the congregation. Singing the Indonesian words, even in my poor pronunciation, made me feel apart of the community. It didn’t matter if I knew exactly what I was singing or even if I was doing it well. All that mattered was that I was joining the community in praising God. I could tell that at the core of whatever I was singing, God was being praised—God received the glory. I’m excited to see where this summer takes me. I have felt embraced by the conference and supported by its people. I recognize the presence of God in the relationships that I’ve begun to foster and the barriers that I’m beginning to help break down. I pray that as I continue my work, I will continue to see God’s dream for the world revealed in authentic and tangible ways. 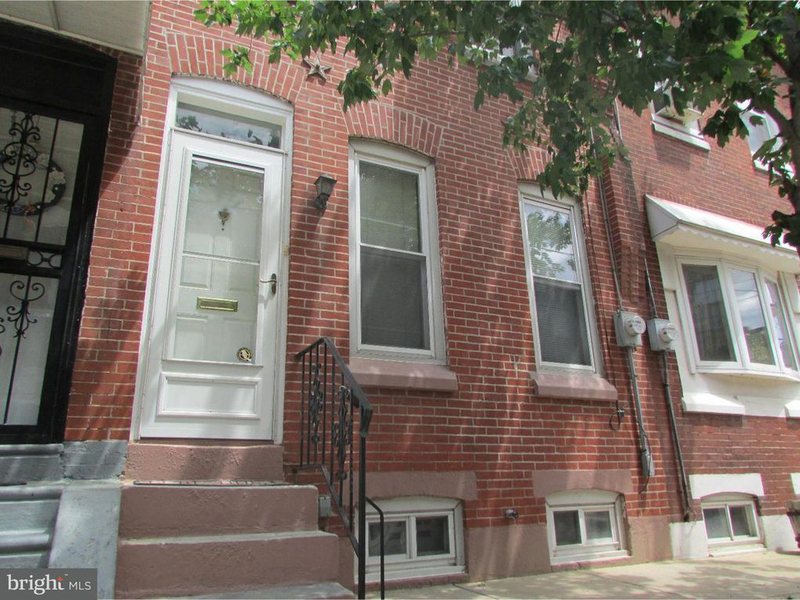 Eastern Mennonite Seminary at Lancaster’s STEP program (Study and Training for Effective Pastoral Ministry) will offer its first cohort session in Philadelphia in September 2010. This cohort is a move by the seminary to offer pastoral training to urban and racially and ethnically diverse pastors. Every year since STEP began in 2004 church leaders from Philadelphia have participated in the program. But it required driving every month to Lancaster for sessions. “Offering STEP in Philadelphia fits with my vision for taking high quality pastoral training as close to the local congregation as possible,” Dr. Wenger said. Karen Jantzi, adjunct instructor at Temple University and member of Oxford Circle Mennonite Church, served on the advisory committee for the STEP Philadelphia cohort. She will also teach in the program. 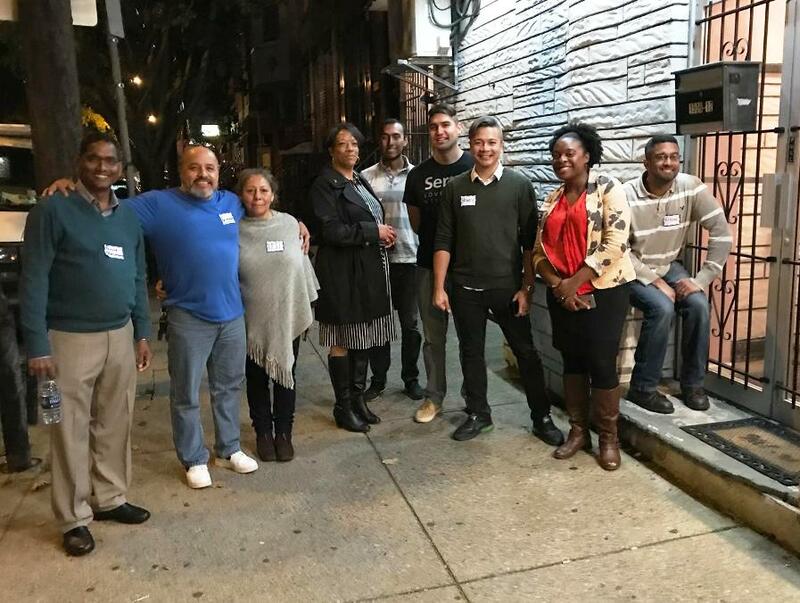 The advisory committee, made up of pastors and leaders in Philadelphia, helped Wenger and EMS determine the feasibility of starting a cohort in the city. They also helped shape the program to make it relevant to the urban context. Wenger is expecting 8-15 persons for this year’s cohort in Philadelphia. Participants will be Anglo, African-American, Indonesian, Vietnamese and Latino. While most will be from urban settings, at least one pastor from a rural congregation will join them. To help with affordability, Wenger is raising money to provide $1,000 scholarships for each participant. The STEP program (Study and Training for Effective Pastoral ministry), a partnership between Lancaster Mennonite Conference and Eastern Mennonite University, provides training for people who are licensed for pastoral ministry or who have been encouraged to consider pastoral work, but may not have had college, Bible school or seminary.